Congratulations to me! Is this me? I received notice of this most prestigious award in my email. I would just like to take this opportunity to thank everyone that has helped make Allen Miller Computer Consulting - oh wait - this award is to Miller Allen Computer Consulting! I guess these most knowledgeable 'judges' snagged my name from the local telco directory listing which was screwed up for a few years. I will just accept the award here - and forego the opportunity to contact the committee so that I can send them MONEY to pay for the processing of the rest of the award! I can hardly contain myself. Isn't it a beauty? 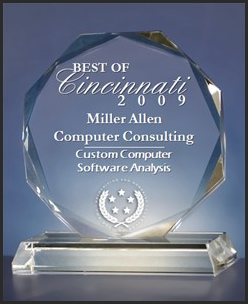 Earlier this year, I sent a notification email to you recognizing that Miller Allen Computer Consulting had been selected for the 2009 Best of Cincinnati Award in the Custom Computer Software Analysis category. Each year, the US Commerce Association (USCA) identifies companies that we believe have achieved exceptional marketing success in their local community and business category. These are local companies that enhance the positive image of small business through service to their customers and community. Also, a copy of the press release publicizing the selection of Miller Allen Computer Consulting has been posted on our website. The USCA hereby grants Miller Allen Computer Consulting a non-exclusive, royalty-free license to use, reproduce, distribute, and display this press release in any media formats and through any media channels. An Award Code has been assigned to your company that can be used on our website for quick access to your award information and press release. The intended recipient of this notification is the Marketing Director for Miller Allen Computer Consulting. If you have received this email in error please forward it to the intended recipient. If you do not wish to receive further advertisements from Best of Cincinnati Award Program, please mail a written request to: us-ca.org, 2020 Pennsylvania Ave, Washington, DC 20006 or simply click to opt-out.